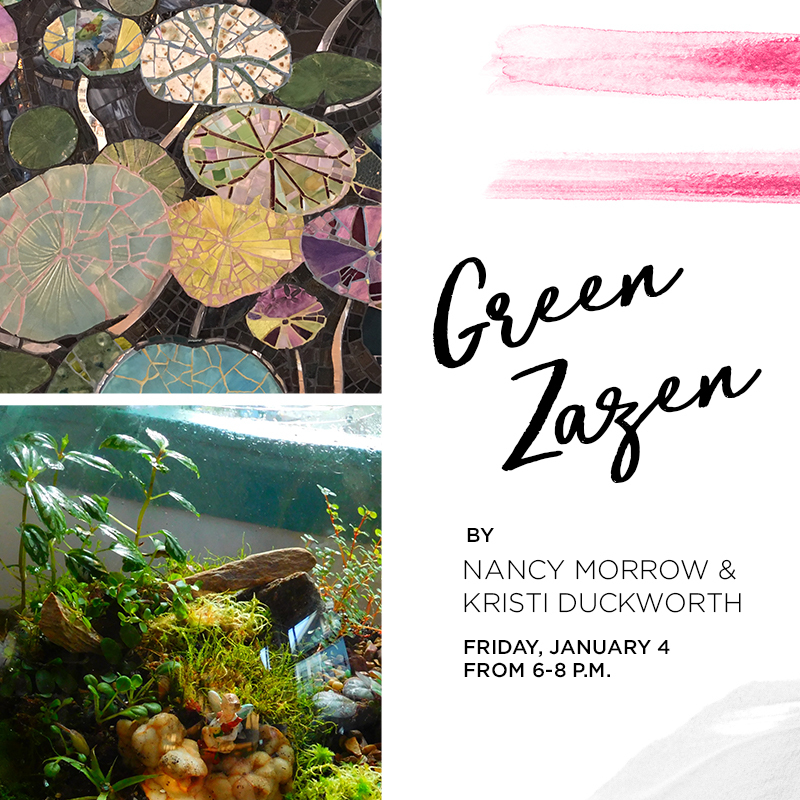 “Green Zazen,” presented by Kristi Duckworth and Nancy Morrow, is a collaborative art show that inspires a contemplative state of mind. This peaceful exhibit encourages visitors to slow down and embrace natural colors and textures, as if there is nowhere to go and nothing to do except look at the clouds, listen to the wind in the trees and feel inspired by nature. 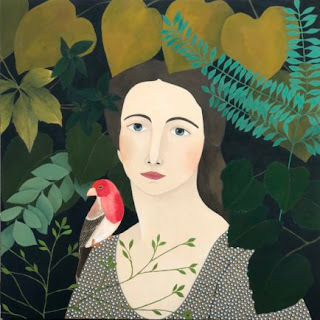 Featured pieces from both artists depict phenomena of the physical world, including plants, animals and microcosm landscapes that inspire the feeling of life moving along, quietly growing and changing as time goes by. Originally from Little Rock, Arkansas, Kristi Duckworth moved to Memphis, Tennessee to attended the University of Memphis in 1985. After earning a degree in graphic design, she fell in love with mosaics and combined that passion with the beauty of nature. 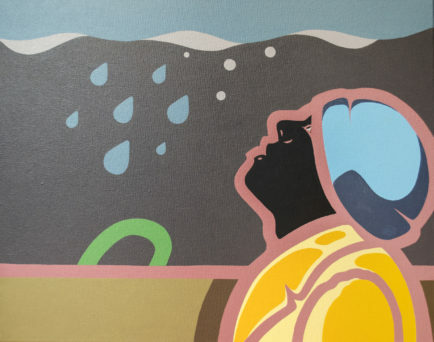 Her work has been commissioned by organizations such as Cancer Survivors Park, the Memphis Grizzlies Foundation, St. Jude Children’s Research Hospital and more. Nancy Morrow has a passion for the art and science of building and maintaining terrariums, kokedama and bonsai. 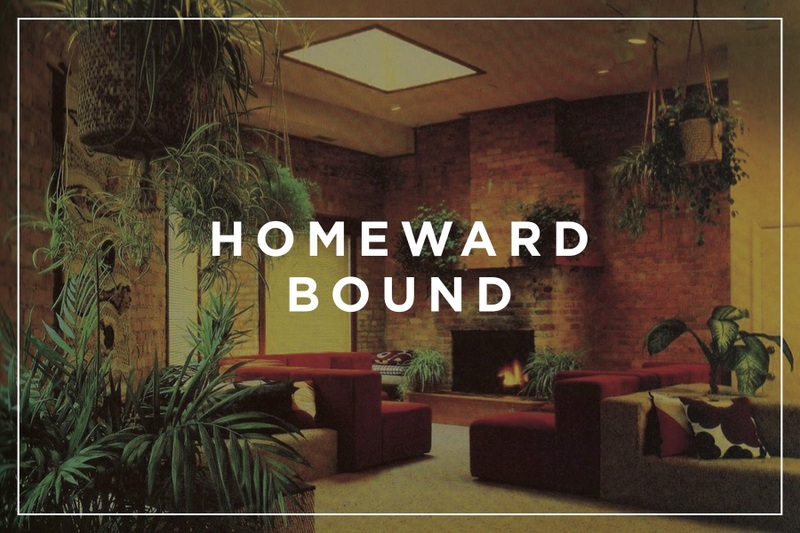 She offers consultations for those who want to learn about house plants and gardening in their homes and office spaces. During a session, students learn basic considerations for selecting plants for a particular space, as well as technical skills for handling, transplanting, watering and more. Once learned, these skills open up the world of plants for all to explore and enjoy. 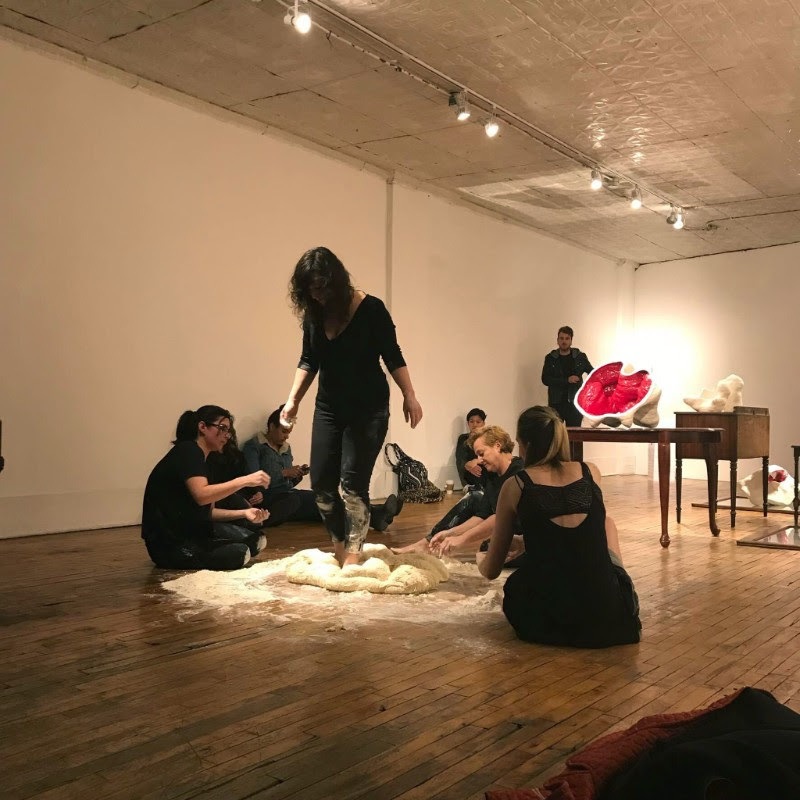 Dis-rupted is a durational performance, led by Crosstown Arts resident artist Santina Amato, that focuses on the materiality of bread dough and women’s bodies in a designated space at 430 N. Cleveland. This will be the largest project Amato has attempted with bread dough, inviting ten female-identifying persons to create 300 pounds of dough in a public performance held on December 4th between 4-8pm, where they will eventually lay, stand or sit in the dough as it rises around them. This work is a continuation of Amato’s investigations into the materiality of dough and her focus on the notion of the intimate body, especially the female body. Meraki! Come see the world the way I do. To see beauty when other people may not. Meraki is a word that modern Greeks often use to describe doing something with soul, creativity, or love — when you put out “something of yourself.” These pictures are me, how I express who I am, and how I feel. I want to celebrate how far I’ve come as a photographer. Self-taught artist Sami Roth’s world is brought to life through paintings and printmaking. Enter a world of fantasy, macabre, and glitter. 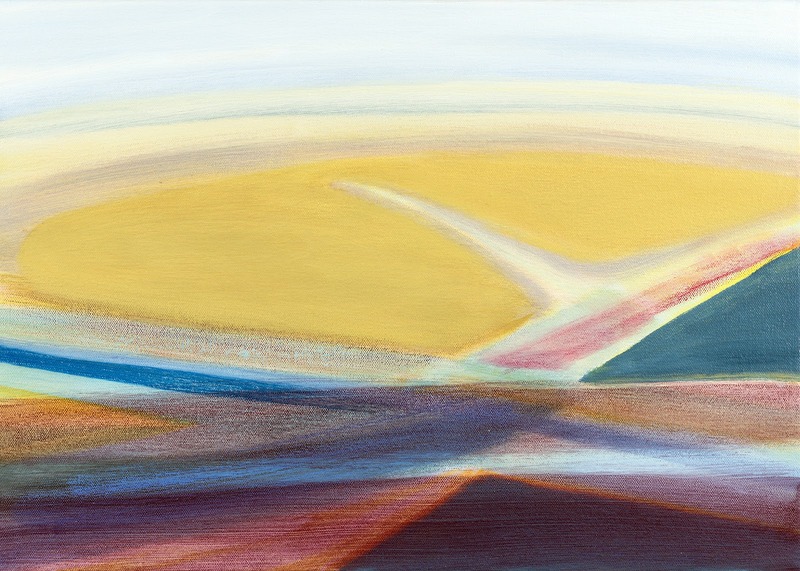 Her art served as an emotional escape during hard times in her life, acting as a form of therapy and self-love, while also kindling her spirituality. 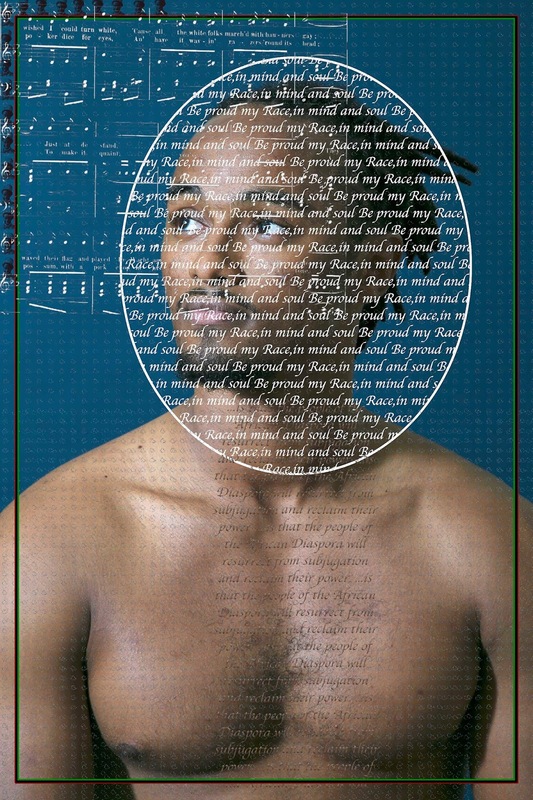 Danny C. Russell presents new works in this opening reception. Join us for an intimate conversation with the children of The Bar-Kays — Larry Dodson Jr. (son of Larry Dodson) and Shuronda Cauley (daughter of Ben Cauley). In conjunction with Give a Damn! Music + Activism at Stax Records, on view at Crosstown Arts through Dec. 2. Throughout the year, Indie Memphis and Crosstown Arts brings cinematographers, directors, editors, writers, and technicians to Shoot & Splice, our monthly filmmaking forum. Come help us celebrate the end of another year at the annual Shoot & Splice Holiday Film Trivia Contest presented by film critics John Beifuss of The Commercial Appeal and Chris McCoy of the Memphis Flyer. An encore screening of the Narrative Short Spotlight 1 block from the 2018 Indie Memphis Film Festival, curated by Short Programmer Brighid Wheeler. Doors at 6:30 pm | Screening at 7 pm. Admission is pay-what-you-can. 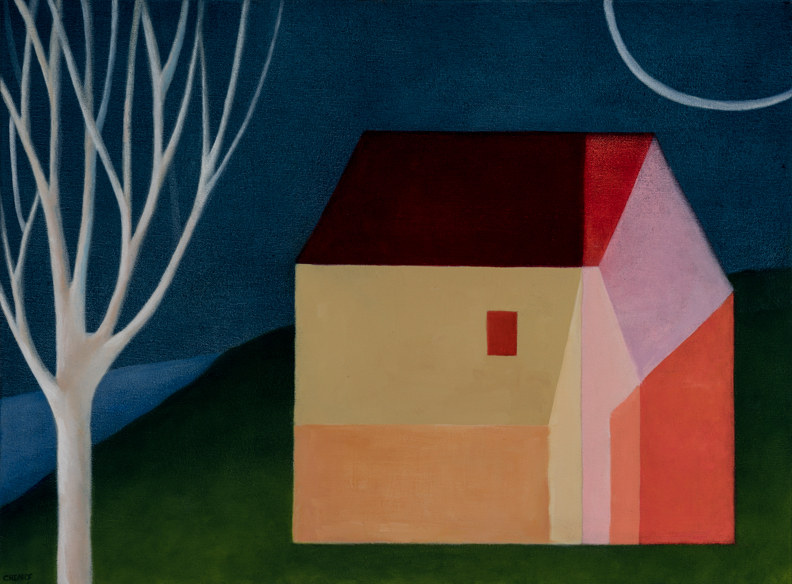 Group exhibition addressing the complex theme of “home.” A place of home has very different meanings to all of us. Sometimes it is a memory, a sense of place, a person, a dream, a certain chaos, a metaphorical anchor, a roof over our heads. 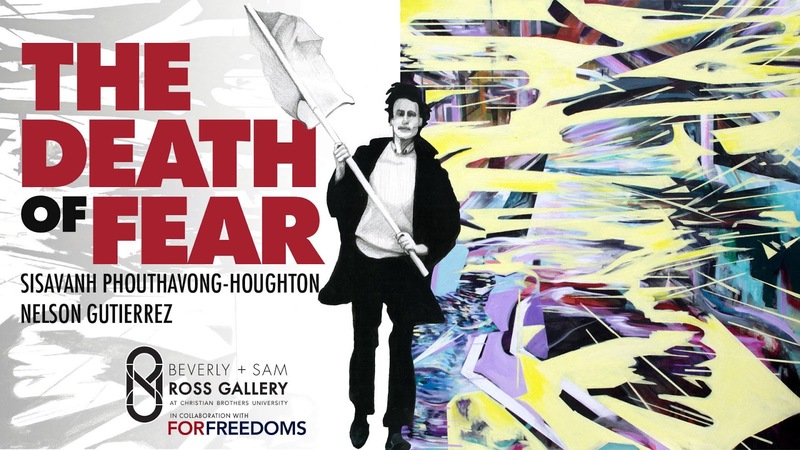 The Death of Fear explores President Franklin D. Roosevelt’s 1941 concept of Freedom from Fear from the perspective of two artists, Nelson Gutierrez and Sisavanh Houghton who immigrated to the United States. 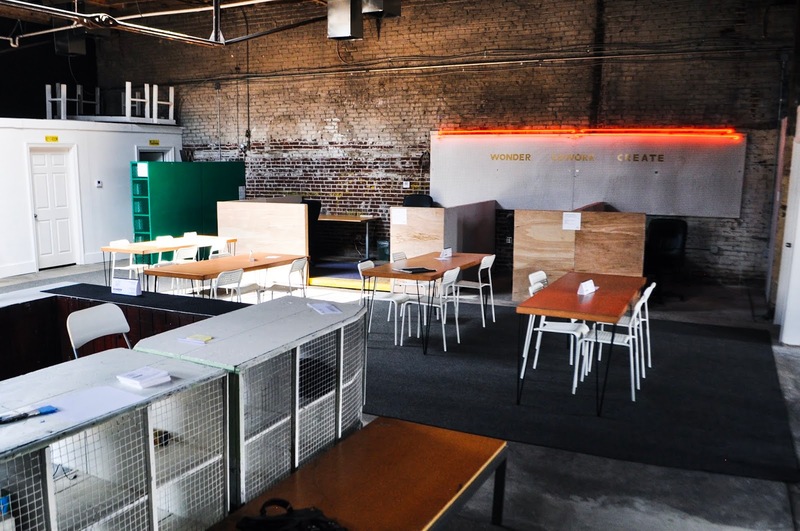 Through methods of isolation, abstraction and collage, each artist explore states of flux, the disconnection from destructive places or politics, and the fearless pursuit for a better life.This exhibition is par of For Freedoms which is a platform for greater participation in the arts and in civil society. They produce exhibitions, installations, public programs, and billboard campaigns to advocate for inclusive civic participation. Inspired by American artist Norman Rockwell’s paintings of Franklin D. Roosevelt’s Four Freedoms (1941)—freedom of speech, freedom of worship, freedom from want, and freedom from fear— For Freedoms Federation uses art to encourage and deepen public explorations of freedom in the 21st century. Founded by Hank Willis Thomas and Eric Gottesman, For Freedoms Federation encourages new forms of critical discourse. Their mission is to use art as a vehicle to build greater participation in American Democracy. Artists explore the body at, against, and beyond its boundaries, creating hybrids, amalgams, and excesses that illuminate the ways that politics and pleasures are made flesh. 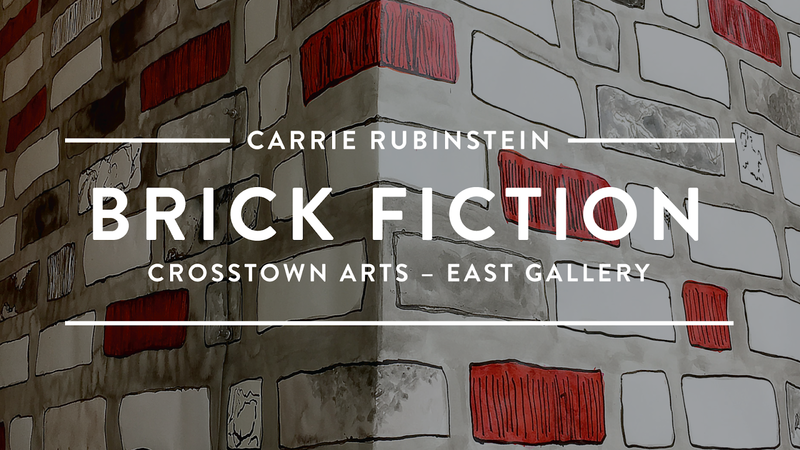 Featuring work by Katie Torn, Alex Paulus, Melissa Wilkinson, and Moth Moth Moth and the Haus of Phantosea. Clough-Hanson Gallery is located in Clough Hall on the campus of Rhodes College. The gallery is open Tuesday - Saturday, 11-5. Admission is always free. Year One is a collection of mixed-media pieces that utilize acrylic, watercolor, maps and embroidery thread in their creation. These pieces carry distinct, feminine material references, while dealing with the human experiences of chance, intuition, balance and control. This collection of abstract pieces evokes nuanced responses that are clear, emotional and reflective. After teaching elementary school for more than a decade, Jill Samuels committed herself to developing an established studio practice. Upon completion of her Bachelor of Fine Arts from the School of the Museum of Fine Arts, Boston, she continued her education at the Fine Arts Work Center in Provincetown, Massachusetts, Rhode Island School of Design in Providence and Flicker Street Studio in Memphis, Tennessee. 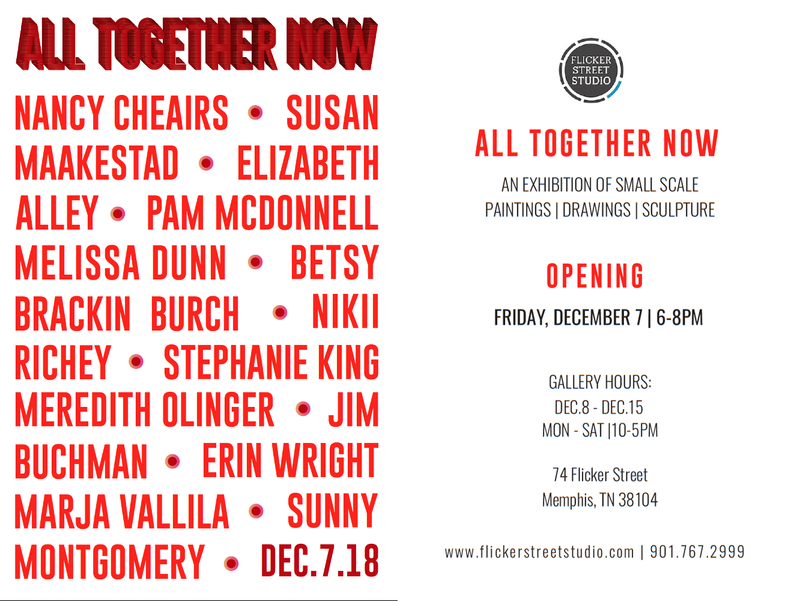 Jill currently works in her studio, in the historic South Main Arts District in Memphis, and has shown work locally at the Levy Gallery and Art Village Gallery. Number is seeking content for our 97th issue and for website publication (pay is equal between formats). Your pitch must be at least 3-4 sentences describing content, venue, location, artist names, etc. Please also include what form your contribution would take: essay, exhibition review, interview, feature article, regional update, nontraditional, and so on. Reviews and updates do not need to follow issue #97's thematic path. Below are full details about the call. We look forward to hearing your ideas. Please forward this call on to other writers. Objects and images, preserved in archives, or immaterial and memorialized in the annals of memory. These are Relics. They are evocative, even provocative, and persevere through miraculous belief the traces of other cultures or markers of one’s own identity. They channel people, places, events, and ideas from the recent and distant past. They can be incredibly specific, affecting individuals or transcending culture and class, impacting communities both local and global. Charged by collective belief systems or personal significance, these items are honored through display and safe-keeping. In reliquaries, places of worship, and museum vitrines, or locked away in vaults, sock-drawers-- their presence embodied in ritual and custom. 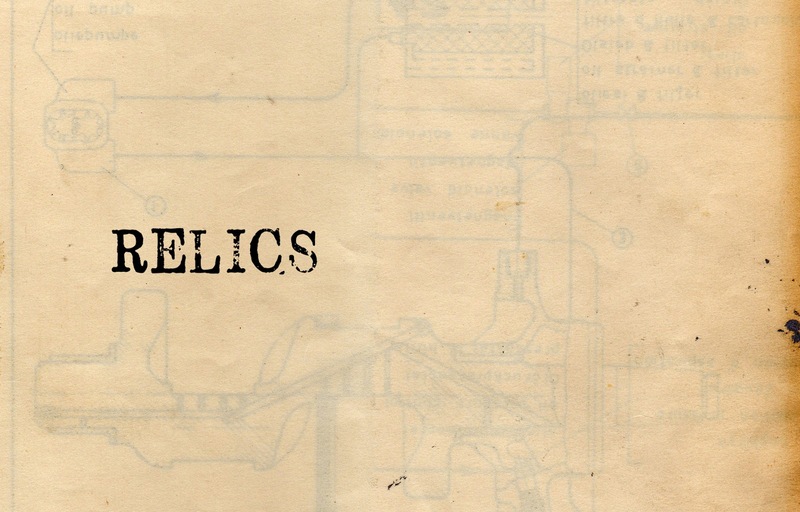 Issue 97 invites proposals from artists and writers that investigate Relics; that consider traditions of making and preserving as well as the long-term significance of relics as they transform the personal, social, cultural and political. If your pitch is accepted, completed 1st draft, accompanying images, and info are due by January 11th, submitted through this Submittable link. Editors will work with each writer to perfect text and accompanying images/info, with final writer-approval coming by January 30th. 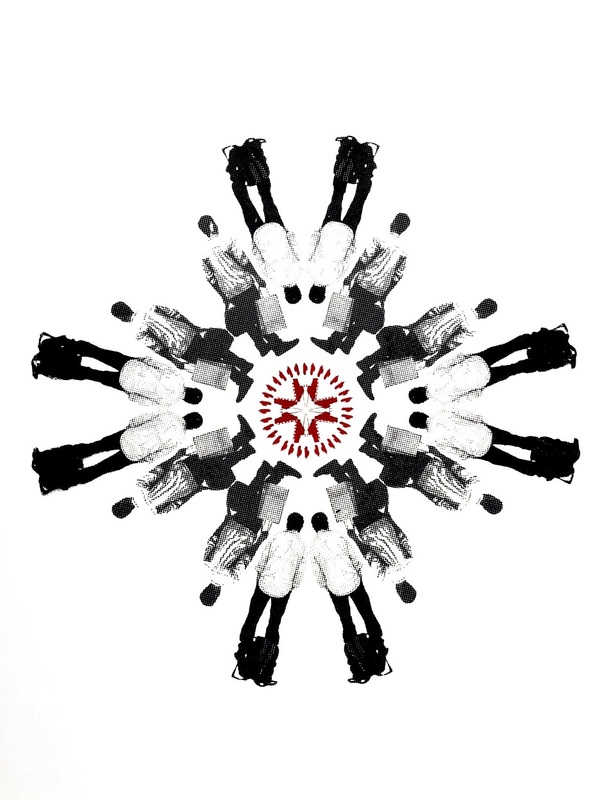 Would you like to participate in a very special performance art event atCrosstown Arts on December 4th? 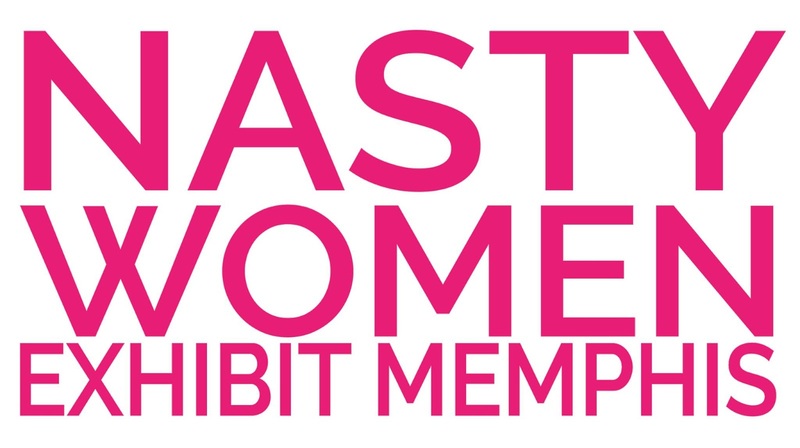 You can meet Santina at her artist talk on Wednesday, Nov 7th from 11:30 to 12:30 at the University of Memphis. This event is free and open to the public. Hope to see you there! 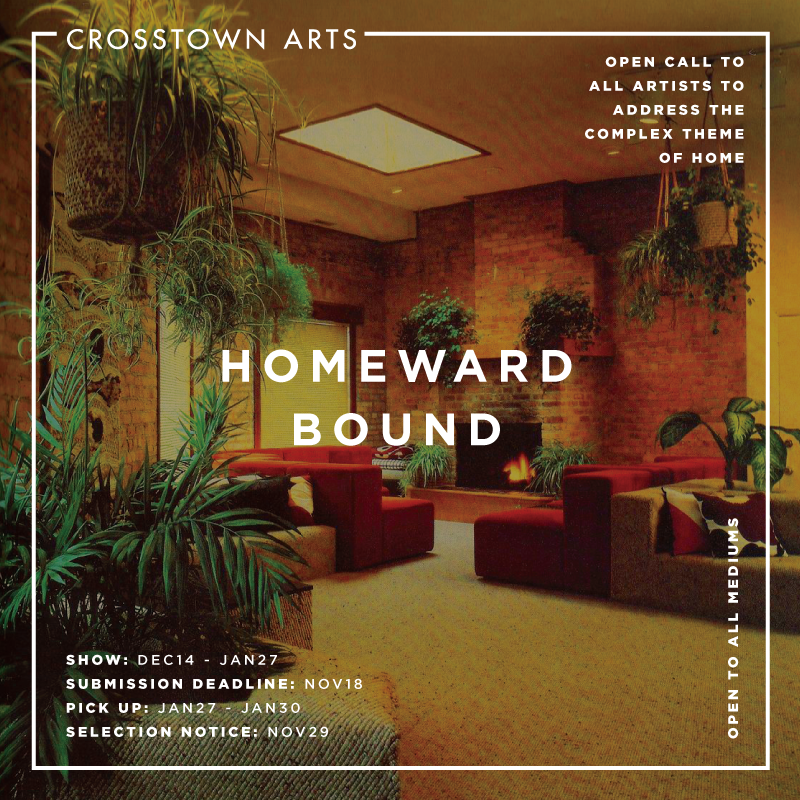 Open call to all artists to address the complex theme of "home." All mediums encouraged - painting, photography, performance, sculpture, mixed media, video and sound. "Here and Now: Printmaking and the Political Present" is an exhibition of prints by Memphis-based artists exploring social issues of our contemporary moment. 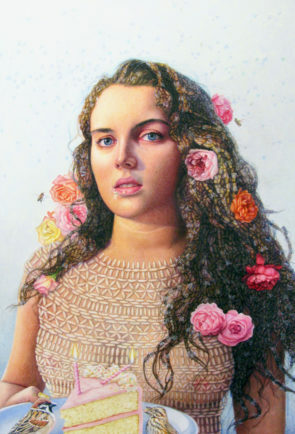 Artists include Maritza Dávila, Vanessa González-Hernández, Nelson Gutierrez, Lawrence Matthews, Carl Moore, Joel Parsons, Jennifer Sargent, and Yancy Villa-Calvo. 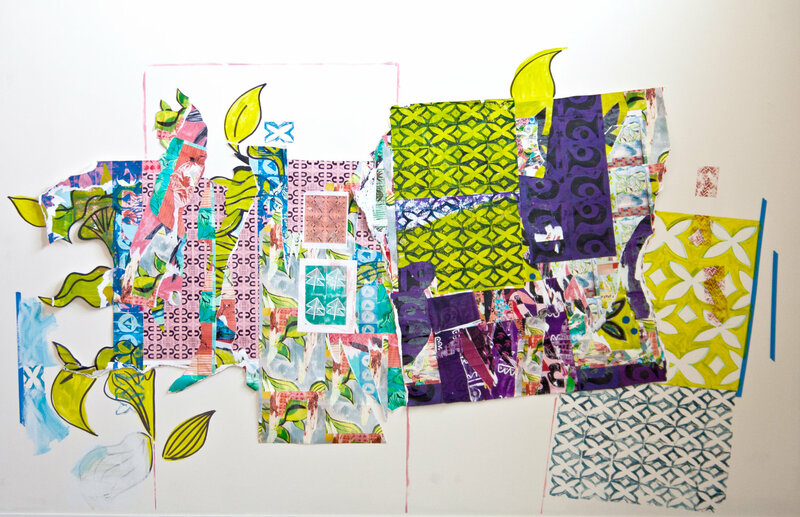 Master printmaker Maritza Dávila has led artists in a series of workshops formulating concepts and producing the prints that will be on view. Artists explore topics such as gentrification, climate change, gun violence, queer politics, immigration, education, and non-violent protest. The exhibition also contemplates the role of printmaking as a means of expression in our fast-paced, digital age. The exhibition runs concurrently with "Freedom of the Press: Posters from Progressive Print Shops, 1960s-1990s," an exhibition organized by the Center for the Study of Political Graphics in Los Angeles, California. Both exhibitions will be on view October 8 - November 9, 2018. 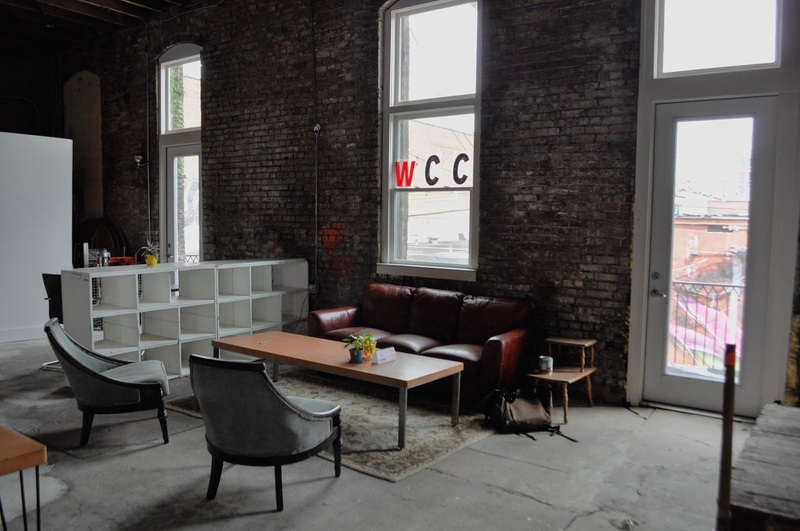 The workshop and panel discussion is offered to the creative local community as part of the Barrier Free: For Freedoms Project with the 50 State Initiative. Seating is limited. Using your artistic voice for advocacy and activism. Tools to give your art a shift to advocate for an issue you are passionate about. Advice to create art provoking thoughts. Mistakes active community artists have experienced. Free and open to art students, artists, and creatives in the community. 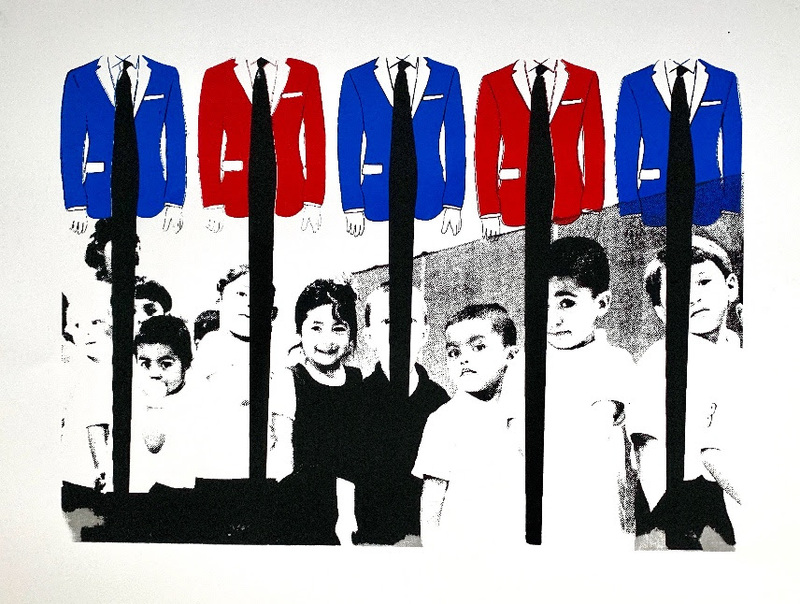 Here and Now: Printmaking and the Political Present is an exhibition of prints by Memphis-based artists exploring social issues of our contemporary moment. 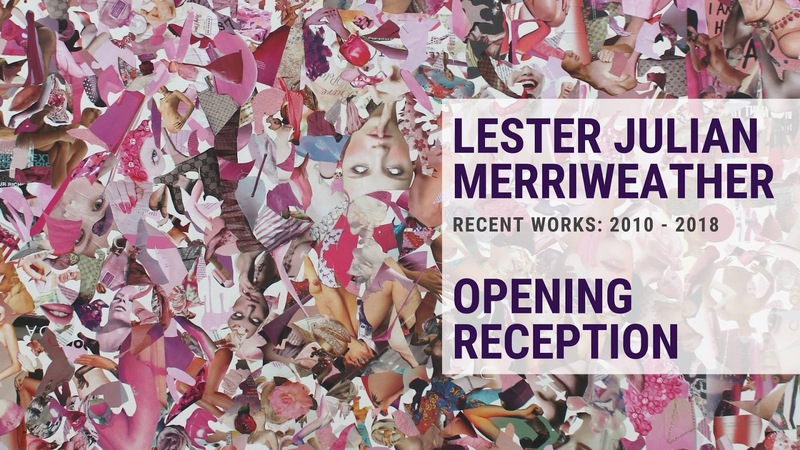 Artists include Maritza Dávila, Vanessa González-Hernández, Nelson Gutierrez, Lawrence Matthews, Carl Moore, Joel Parsons, Jennifer Sargent, and Yancy Villa-Calvo. Master printmaker Maritza Dávila has led artists in a series of workshops formulating concepts and producing the prints on view. 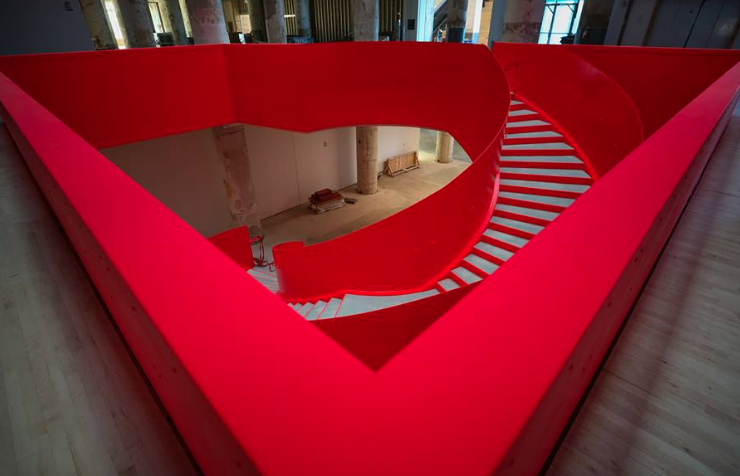 Artists explore topics such as gentrification, climate change, gun violence, queer politics, immigration, education, and non-violent protest in their work. The exhibition runs concurrently with Freedom of the Press: Posters from Progressive Print Shops, 1960s-1990s, an exhibition organized by the Center for the Study of Political Graphics in Los Angeles, California. Above: Vanessa González-Hernández, No Child Left Behind, 2018. Screenprint on paper. Courtesy of the artist. Oppositional presses have been challenging the status quo in the United States since Benjamin Franklin helped form the first printers' union in the colonial period. From Quaker broadsides against slavery to posters supporting affirmative action, printers have put ink to paper in the struggle for peace and justice. Political posters held a venerable position as one of the principal modes of dissent in the nineteenth century, and they were widespread during the 1930s and 1940s until the chilling atmosphere of McCarthyism in the 1950s stifled the voices of protest. Their popularity and importance in the United States was revived during the civil rights and anti-Vietnam War movements, and posters continue to enliven movements for social change today. Produced by the Center for the Study of Political Graphics, in conjunction with the Progressive Printers Network, this exhibition presents prints from print shops throughout the United States and Canada addressing issues ranging from women's rights to the anti-Apartheid movement. By focusing on the printshops, the exhibition examines a unique approach to organizing for social change through collective work. 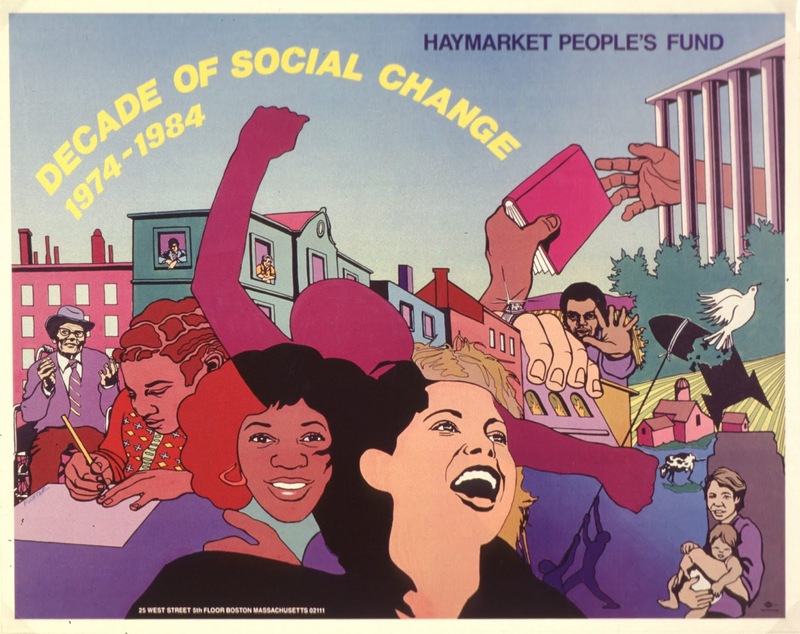 Above: David Fichter, Decade of Social Change 1974-1984, 1984. Offset print. Red Sun Press, Boston, MA. 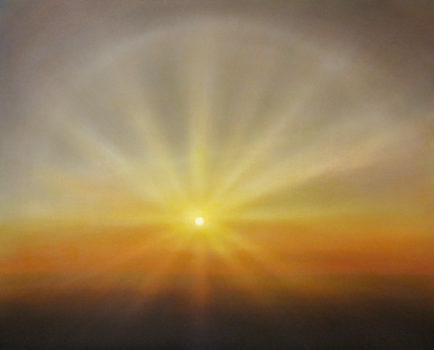 Matthew Hasty, Golden Hour, oil on canvas, 48"x60"
CAN ART STOP A WAR AND SAVE THE PLANET? Join us for a lecture by Carol A. Wells, Founder and Executive Director of the Center for the Study of Political Graphics (CSPG) in Los Angeles, California. Wells is an activist, art historian, curator, lecturer, and writer. She has been collecting posters and producing political poster art exhibitions on a variety of human rights themes since 1981. Trained as a medievalist at UCLA, she taught the history of art and architecture for thirteen years at CSU Fullerton until a poster changed her life. 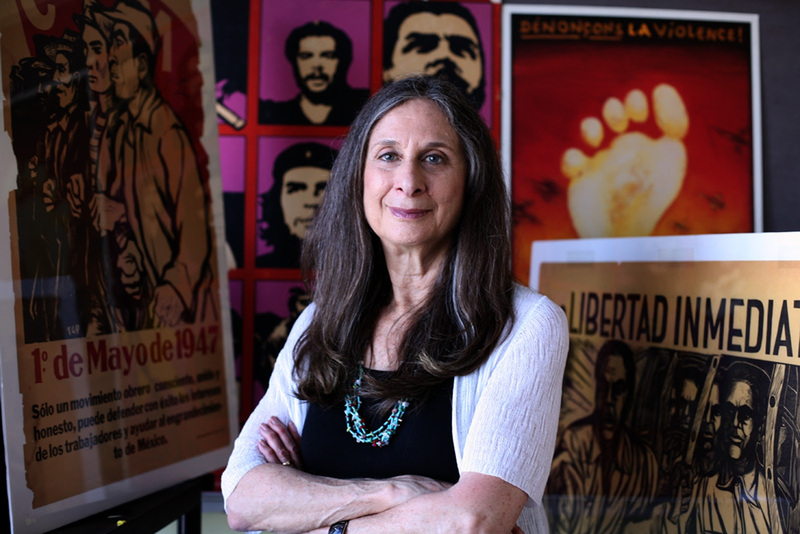 In 1988, she founded CSPG, an educational and research archive with more than 90,000 social movement posters from the 19th century to the present. 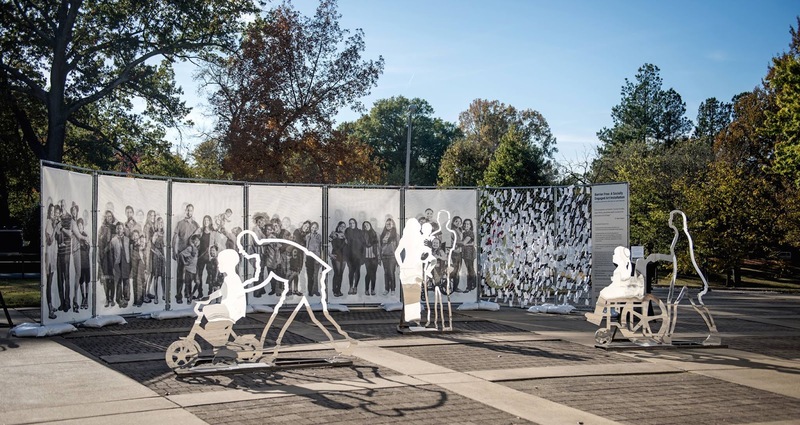 She believes that the power of graphics can combat public apathy and feelings of helplessness, and help open up a truly democratic arena for political debate. This lecture is presented in conjunction with the exhibition Freedom of the Press: Posters from Progressive Print Shops, 1960s-1990s organized by the Center for the Study of Political Graphics, on view in The Martha and Robert Fogelman Galleries of Contemporary Art, October 8 - November 9, 2018. Free and open to the public. Tops is excited to announce John McIntire, an exhibition of sculptures and drawings by the esteemed Memphis artist and enduring cultural figure. For the show at Tops, McIntire will be exhibiting sculptures carved in marble and wood, recent drawings made on blank white baseball caps, and a selection of drawings and sketchbooks from the past 50 years. An artist whose work is both virtuosically skillful and playfully experimental, McIntire is best known for his sculptures. The elegance and resolution of these modernist forms belie their creators restless energy. The works are solid and heavy and embody an ancient permanence. Included among these works will be McIntire'sgame sculptures. In these pieces McIntire teases the austerity of modernism by puncturing his essential forms with a maze of holes in which marbles can be inserted and expelled. 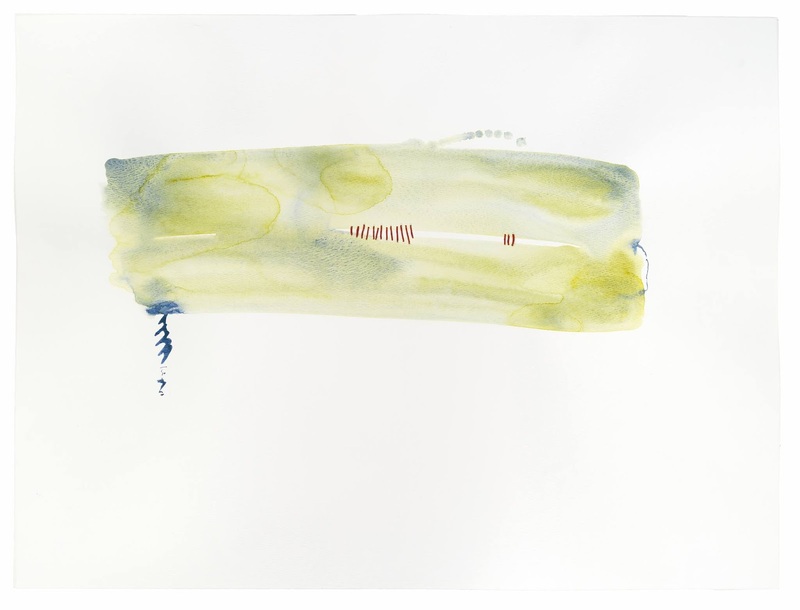 McIntire is also an artist equally engaged in the most ephemeral of forms. His interest in chance or luck incites his engagement with the overlooked and discarded. His searching impulse to glean and rescue attest to an ongoing openness to possibilities and a joy in objects. After McIntire came across some discounted white ball caps earlier this year he began making drawings on them, using the crown as a bulbous field to create unlikely scenes and transfiguring his find in the process. A selection of sketchbooks from the past 50 years will also be on display providing glimpses into the artist's extensive involvement in Memphis culture and how his material work exists in concert with less tangible creative pursuits. 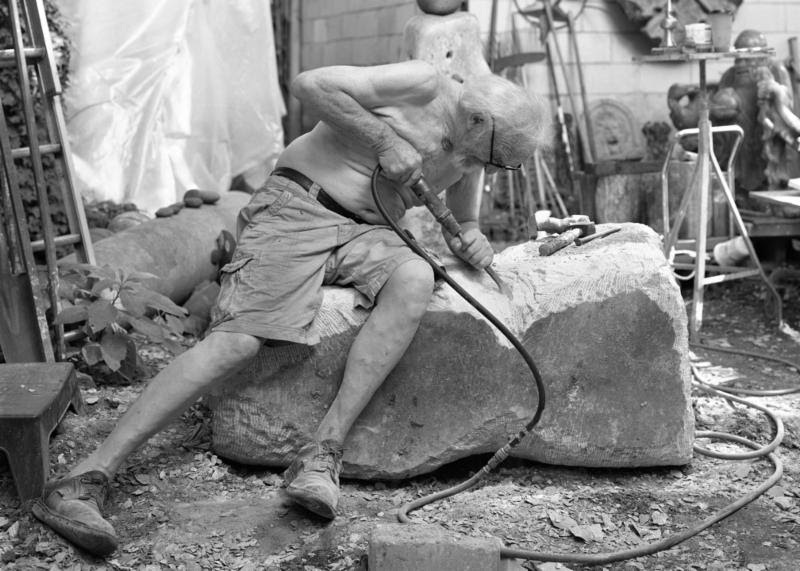 From presiding over the 1960's creative hubs that were Beatnik Manor and the Bitter Lemon, to teaching sculpture for decades at the Art Academy and helping start the Memphis Country Blues Festival, McIntire has been a facilitator, collaborator, teacher, and an example for generations involved in concrete and fleeting creative endeavors. The sketchbooks on view depict sudden ideas jotted down, people (unknown and celebrated) drawn, figure studies and cartoons. These books depict whatever McIntire was involved in at the time, whether that was Furry Lewis playing at the Bitter Lemon or figure studies at the Art Academy or new plans for sculptures. All pursuits exist in these sketchbooks, as in life, one on top of another. These large-scale, landscape cyanotypes on fabric link the tactile and the visual by committing the photographic process to the physical landscape. 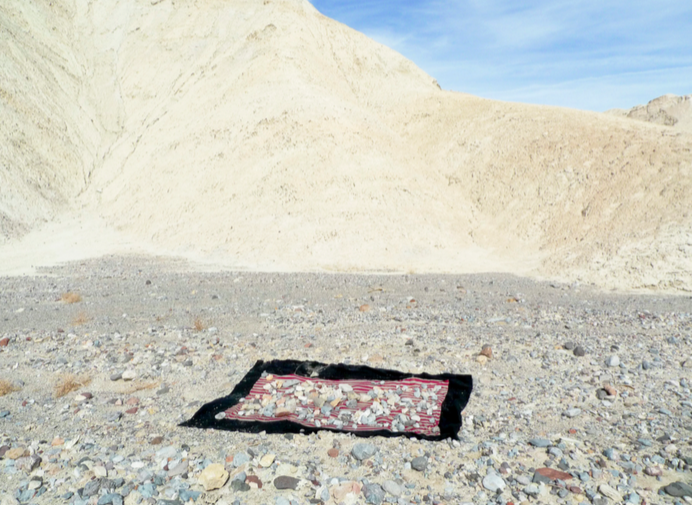 Pearson works outdoors on the ground, making 1:1 indexical photographic prints during midday sunlight. In these photographs, view is replaced by elemental record; while the horizon, removed from the composition, becomes the topographic support and source for construction of the images. Pearson’s intention is not to convey the solely visual appearance of place — in this case, the arid southern California landscape — but rather to invoke a more dynamic experience of place by means of the transformative nature of photography. My intention is to provide the viewer a photograph that offers an experience of the landscape that does not rely solely on visual appearance. An image of a different scope that conveys the material phenomena of a location, a more tactile involvement with the landscape, that attempts a solution to the distance conventional photography asserts. My interest is to bridge this gap between being immersed in a landscape and simply looking at it as a photograph. These large-scale, landscape cyanotypes represent an experience of the arid Southern California landscape. They are made outdoors on the ground in the middle of the day in Griffith Park and Death Valley. This is a rudimentary photography, made without camera or film, recording the moment, the light, and the terrain of a particular but negligible plot of ground in a vast space at high noon. It is influenced by the landscape embodied in the 1940s cyanotype photograms of Anna Atkins, and it responds to the grand vistas of photographers such as Ansel Adams by bringing vision back to the body and using what is within reach: rocks, dirt, open sky, and sunlight. This series of photographs is an inquiry of place, an expression of a phenomenological sensation, and a proposition of sense. The videos and photographs both are invested in observation, the presence and action of light, the parallels of light entering the shadowed interior of the camera and the eye functioning as an aperture to the blackness of the body’s interior. That dependence of light on darkness interests me. Video provides a physicality to the process of making images, a physicality that links vision back to the body, to movement and pulse, rather than the mechanical idealized view of the camera. Video is more performative and allows for an intuitive, animated exploration of light. The Wish Book series is a series focusing on non-traditional approaches to film as a medium. Curators Brian Pera and Terri Phillips welcome internationally recognized artists, filmmakers, and critics to Memphis for this exciting series, which takes its name from the famed Sears Catalog and is hosted by Crosstown Arts at Crosstown Concourse, itself once a major Sears distribution center.